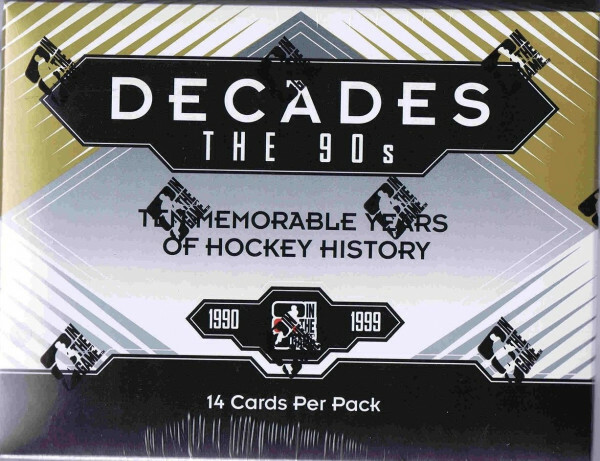 Factory Sealed 2013/14 In The Game Decades - The 90's Hockey Hobby Box mit 1 Pack a 14 Cards per Pack. 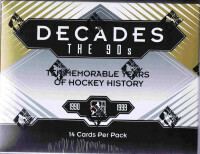 Produktinformationen "2013/14 In The Game Decades - The 90's Hockey Hobby Box"
Look for 90's stars like Lemieux, Yzerman, Bure, Lindros, Jagr, Fedorov, Joseph, Lidstrom, Selanne, Thornton, Roy and many others! The 200-Card checklist will bring back many great memories! Subsets include First Round Pick, Enforcers, Cup Clashes, Dynasty, Decades Players, and Decades Coach - all with silver and gold parallels. Not to mention Decades Rookies and Decades Mask Non-Memorabilia Inserts! Over 170 Hard-Signed Autographs to collect! What better way to re-live one of the best hockey decades through a fantastic set of Game-Used Memorabilia Cards! Look for All-Stars, Cup CLashes, Rookie/Retired, Rivalries, and European Influence. Weiterführende Links zu "2013/14 In The Game Decades - The 90's Hockey Hobby Box"
Fanbewertungen für "2013/14 In The Game Decades - The 90's Hockey Hobby Box"